Ben Bernanke is trying like mad to stimulate credit and lending but to no avail. It's an uphill battle because of demographics, student debt, and lack of jobs. 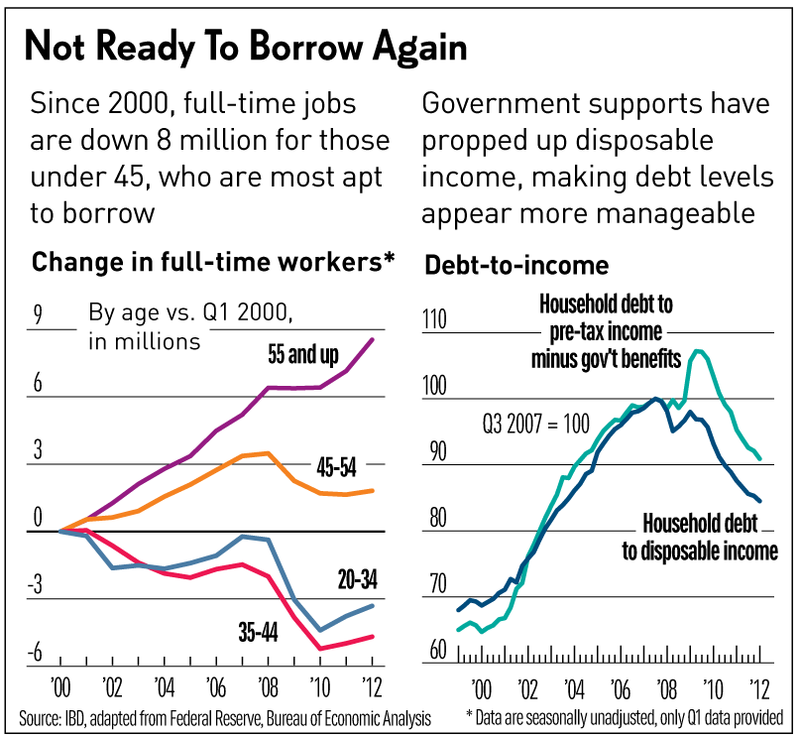 Citing falling debt-service needs, some economists think consumers may be ready to go on a borrowing spree. They are badly mistaken. I agree with Jed Graham on Investor's Business Daily who says falling debt-service needs is an illusion. Graham makes the case in Consumer Credit Impaired By Under-45 Job, Debt Woes. Nearly four years after a borrowing binge gave way to financial crisis, have households slashed enough debt to take on new credit and start spending again? Yes, says a growing chorus of economists, with some evidence to back them up. The Federal Reserve's ratio of debt service payments to disposable income is at its lowest level since 1994. But that traditional measure is a poor guide today, as credit-hungry adults under 45 bear the brunt of the jobs, housing and student loan crises. Considering where more of the income is coming from (government supports), who's earning a bigger share of wages (baby boomers) and which type of debt has been on the rise (student loans), re-leveraging may be a long way off. Graham's analysis is correct. Here are some points from the article that will explain why. The number of full-time workers younger than 45 has fallen by 9 million, or more than one in seven, Labor Department data show. The number of full-time workers ages 55 and older has climbed by 8.5 million. The 35-44 population has shrunk by 4.5 million over the past 12 years. The huge baby boomer cohort has aged while Generation X is unusually small. Student debt has soared to nearly a trillion dollars. About two-thirds of it is held by those under 40. Among those age 30-39, 25% have student loan debt, with an average balance of $28,500. New York Fed research shows that of 37 million student loan borrowers last fall, only 39% were paying down their balances. To Graham's analysis I would add the jobs picture is bleak. The 4-week moving average of weekly unemployment claims is at the highest rate of the year, at 386,250. Let's put it all together and look at the picture from the point of view of housing. 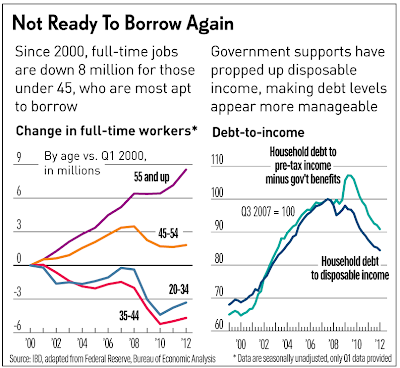 Kids are graduating from college deep in debt with poor job prospects. Those with too much debt and too little income are sharing apartments or moving back home, not buying homes and starting families. Boomers are looking to downsize, not buy more toys and larger houses. Factor in the rapidly slowing Chinese economy (China Manufacturing PMI 7-Month Low, Sharpest Decline in New Export Orders Since March 2009 coupled with Europe in the midst of a severe recession, and it's difficult if not impossible to see just where US growth will come from. Nonetheless, I believe housing is bottoming. I made the case in New American Dream is Renting; Reflections on Renting Houses, Cars, Books, Clothes; Will Rentership Fuel the Next Boom? What About Home Prices? However, even "if" housing is bottoming, don't expect either housing or the economy to go anywhere fast. Prospects for family formation are fundamentally very weak and overall economic fundamentals are very weak as well.